In particular, we’ll look at why nominee accounts and segregation can’t protect you from all risks, plus the main things you can do to protect yourself from the chance of a stock broker collapse. Certificated form. The traditional way of holding stocks. You receive a physical paper certificate confirming your ownership. Your name appears on the register of shareholders. Electronic form with direct registration. The direct successor to traditional certificates. There are no physical paper certificates – instead shares are in dematerialised form, meaning their existence is recorded by the central securities depository in the country in which the stock is listed. Your name appears on the register of shareholders (or in some countries, on a sub-register operated by the central securities depository). Pooled nominee accounts, also known as omnibus accounts. The shares are usually held in electronic form, but the name that appears in the records as the legal owner is a nominee company, which is usually owned by your stock broker (nominee companies are explained in more detail below). Many different investments held by clients of your stock broker are bundled together in the name of the same nominee and the stock broker records which client then has the rights over which shares. Stocks held in this way are referred to as being held ‘in nominee’ or ‘in street name’, depending on the country. Your name does not appear on the register of shareholders. Designated nominee or sole nominee accounts. It is unusual for individual investors to use this kind of account – they are more commonly employed by institutions. The stocks are registered in the name of a nominee company, but they are not bundled together with other clients’ holdings. Your nominee account is used for holding your assets only. Your name does not appear on the register of shareholders. While certificated form was the traditional way of holding stocks, pooled nominee accounts are now by far the most common. Stock brokers prefer it because it cuts costs and makes the process more efficient. In addition, the fact that the stocks are recorded in their name means you will almost trade via them when you come to sell (in many markets you can transfer stocks out of a nominee account to another stock broker, but you will usually be charged for this). Having stocks recorded in your own name at the central securities depository is uncommon in most countries and not possible or awkward in many. There are some exceptions, such as Singapore, where most local brokerage accounts require you to have your own account at the Central Depository (CDP), or the UK, where the process of having a personal account at CREST is simple, if rarely done by most investors. Unless you know otherwise, your account is almost certainly a pooled nominee one. This means that the legal owner of the shares is your stock broker and your assets are mixed up with many other clients. Put like that, it may sound quite alarming. So how safe is a nominee account? Before thinking about this question, let’s look at how the nominee account system works. Your shares are legally owned by a non-trading subsidiary of your stock broker, known as a nominee company. (Sometimes a third-party company hired by your stock broker will be used instead of a subsidiary – more on this later on.) However, while the nominee company is the legal owner of the shares, you are the beneficial owner, meaning that you have rights over them. Your stock broker will keep records of which client is the beneficial owner of all the shares held by the nominee company, trade your holdings according to your instructions and pass cash from the sale of your shares or from dividends on to you. Having the shares owned by a non-trading company rather than the main brokerage business means that your assets are legally separate from the assets and liabilities of your stock broker. The segregation between client assets and company assets is crucial to how this arrangement operates. If the broker goes bust, your stocks are still your property. The creditors can’t touch them. If your investments were just assets of your stock broker and could be claimed by its creditors, you wouldn’t have any security at all. So in theory, segregation ensures your investments are safe. But how much protection do segregated accounts really provide? Cases such as MF Global, in which clients in segregated accounts lost money, demonstrate that it doesn’t always work. Segregation is effectively an honour system, where the broker is expected to do the right thing and keep client and firm assets separate. In some cases, regulators and exchanges will be checking up on their holdings regularly, but obviously they can’t keep an eye on what’s in which account all the time. So the system is open to fraud and abuse. If your stock broker decides to sell or move shares from nominee accounts, they will be able to do so. And of course, fraud like this is most likely to happen when the firm is on the edge of collapse, needs cash or assets to meet its own liabilities and the temptation to ‘borrow’ client assets for a while to tide them over becomes too great – or simply when the management decides it’s time to loot client assets and retire somewhere with no extradition treaty. So the point at which segregation is likely to offer no protection is just when you need it most. It’s also worth being aware that even if there hasn’t been deliberate fraud, when a stock broker collapses its records often turn out to be shaky. So establishing which clients own what in the nominee account may take a lot of work and assets may sometimes turn out to have been misplaced in the turmoil. So while the industry often presents segregation as the thing that guarantees the safety of your investments, it’s nothing of the kind. The safety it offers is limited and the system is close to being the absolute minimum that could be accepted, rather than added protection for investors. So what further protection do you have? Essentially, just one thing. Most major markets have some kind of investor compensation scheme covering assets held with a stock broker or other investment firm. These will pay compensation up to a certain limit if assets are missing from your account and your stock broker is unable to make good the difference. Terms vary between countries. There are strict limits to the amount that will be paid and some assets are often not included. Generally, these schemes could be a lot better – but they’re better than nothing. Compensation schemes typically apply the limit across all accounts you have with a company – but, of course, not across companies. So if you have a larger account and you want to improve your protection, the obvious thing to do is to have accounts at more than one stock broker. Not only is it less likely that both will fail at the same time, but would be entitled to separate compensation allowances on both accounts if they did. Some investors also feel that having shares directly registered in your name through the central securities depository (where this is possible) rather than through a nominee account is safer. Whether this is true is debatable. Under most systems, regardless of what name the stocks are in, your stock broker still has access to them to sell them – otherwise they wouldn’t be able to carry out your trades. So that means they could choose to sell them fraudulently without your instructions, just as they could in a nominee account. It’s possible that in a fraud, pooled nominee accounts would be raided before directly registered ones. And it’s likely that in the event that a stock broker collapses, investors with shares in their name would get access to their investments much more quickly than those using pooled nominee accounts, because the ownership of these shares would be much clearer (although this doesn’t seem to have been tested, presumably your personal account at the securities depository could simply be moved across to another broker almost immediately). So there may be some limited security advantages to holding shares in your name, in addition to other advantages being on the register of shareholders brings. But generally it won’t provide complete protection. What we’ve discussed so far mostly applies to the situation where you are investing in stocks in home country through a local broker – or possibly through in foreign stocks through an account with a broker in that foreign country. If you’re investing internationally through your domestic broker, it’s a different matter. In general, your broker won’t have nominee companies linked to the central securities depository in each country it offers and so won’t take custody of your securities directly. Instead, it will use a third-party custodian, typically a division of a major global bank that offers these services, such as BNY Mellon, BNP Paribas, Brown Brothers Harriman, Citibank or HSBC. 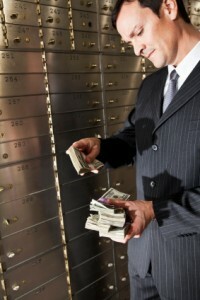 The securities will be held for your stock broker in a nominee account at one of these banks. There are exceptions – some international stock brokers will have local subsidiaries to handle custody in all or some of their markets themselves. For example, as far as I’m aware, Interactive Brokers holds the assets itself (although Saxo Bank uses custodians in most markets). But generally only the largest and most global firms will get involved in overseas custody. Normally, your foreign shares will be held at a custodian bank. This introduces an additional link into the chain. Obviously, the assets held in custody by one of these banks are segregated from its own operations and these are generally very large global institutions. If you want to imagine worst-case scenarios, it’s possible that a major custodian could fail – but the consequences would be so far-reaching that some kind of bailout would be almost certain. But more plausibly, in some markets – especially smaller emerging markets – a custodian that doesn’t have a local division may in turn have engaged a sub-custodian to do the holding on its behalf. It’s perhaps much easier to imagine a smaller sub-custodian in a less well-regulated market failing and your stock broker’s main custodian may not necessarily be liable for assets missing from its sub-custodian. The use of third-party custodians is not always confined to overseas stocks. A stock broker that trades local stocks on your behalf generally doesn’t have to keep them in custody itself (and when dealing with institutional investors, they often won’t – the investor will usually have their own custodian that’s separate from the broker they use). Some stock brokers may choose not to look after any client assets and instead outsource all of the custodial arrangements to a specialist. For example, many discount stock brokers in the US use firms such as Penson Financial Services to handle all custodial, clearing and settlement services behind the scenes. It’s important not to overstate the risks from all this, but you can see that the question “Where are my stocks held?” is technically and legally far more complicated than “In my account at my stock broker”. The way the system works is not perfect and certainly leaves investors exposed to risks most don’t understand. Most of all, it should be clear that assurances about client assets being segregated are not really any assurance at all, as clients of spectacular failures such as MF Global occasionally find out. How can you keep your investments safe? There is no single answer. Even the traditional method of paper certificates – sometimes suggested as being safer than modern dematerialised share trading – is vulnerable to loss, theft and forgery, as well as being far more inconvenient. However, only using reputable stock brokers, having more than one account and trying to keep assets at each firm under the relevant compensation scheme limits are very obvious and easy steps to take.